Authorities: Oil on the beach "natural seepage"
The oily mess of tarballs that washed up on Northern California beaches earlier this week is “natural seepage” from the ocean floor and not remnants from the Cosco Busan oil spill, the Coast Guard said Wednesday. When oil started showing up on beaches from Pacifica to Monterey on Monday, speculation was it might be uncollected oil from the November 7, 2007 spill in San Francisco Bay. Only about 40% of the 53,000 of the bunker fuel oil that spilled has been recovered. Big patches of oil debris and tarballs are washing up on Northern California beaches this week. The first question on people’s minds, is this the remnants of the Cosco Busan oil spill in San Francisco Bay on November 7, 2007? From Ocean Beach in San Francisco south past San Mateo County beaches, the oily mess has cleanup crews out picking up the debris. Recent storms may be the culprit. At least six weeks after the Cosco Busan oil spill struck San Francisco Bay, the popular beaches at Angel Island will reopen on Saturday. The reopening is with an asterisk. State officials are warning visitors there still may be tar balls of oil remaining on the island beaches. 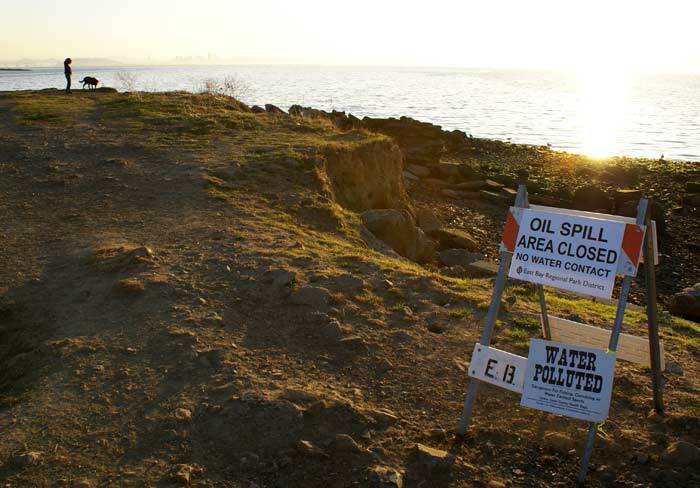 The same oil killed thousands of birds and marred miles of coastline. 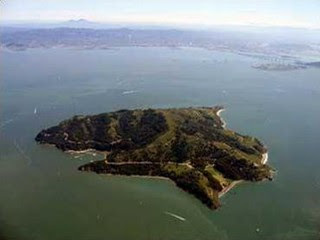 Angel Island is the largest island in San Francisco Bay. It’s beaches were closed shortly after the November 7, 2007 oil spill. The spill was caused when a South Korea bound container ship, the Cosco Busan, struck the San Francisco-Oakland Bay Bridge dumping 58,000 gallons of bunker oil. There are some bay area beaches that are still closed, including Rodeo Beach and Pirates Cove in Marin County. Point Isabel and Eastshore State Park are expected to open by the end of next week. More than 231 cleaned birds have been released back in the wild. Birds are being set free at Heart’s Desire Beach in Tomales Bay. This at the Point Reyes National Seashore area about 40 miles north of San Francisco. As of November 26, 1,060 oiled birds arrived live to the bird center in Cordelia. A total of 782 have been washed of oil. At least 1,693 dead birds have been collected in the field. 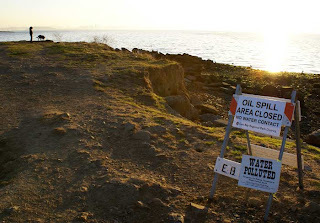 One of the big problems we’re seeing in this tragic oil spill in San Francisco Bay is the HUMAN element. Many of our wildlife rescue members have reported running into many people ignoring “closed beach” signs. These thoughtless folks continue to run and walk dogs (on and off leash) along stretches that should be off limits. Oiled birds are super STRESSED, cold and often starving. The last thing they need is the extra visual stimuli that comes from joggers and dog walkers. They view any intruder into their space as predators and will use the last bit of energy to escape back into the water. At Pt. Richmond, numerous dog walkers continue to have dogs off leash in sensitive areas. In one account, a dog owner had his dog swimming in the bay and managed to scare off at least 50 oiled birds. This careless act kept birds in need of care out reach of wildlife rescue personnel. We had another report from a crew member who was shocked beyond belief. He watched as a dog owner ran his big dogs on an oil covered beach near Golden Gate Fields in Albany. The owner then pulled out a ball and began throwing it into the oily bay for the dogs to fetch. When asked to keep dogs off the beach, the owner responded in a very unpleasant fashion. Please! For the sake of these oiled animals and others, keep your dogs away from sensitive areas on the bay and beaches. LEASH YOUR DOGS at all times around the affected areas, including jetties, boat docks and low tide areas. Let our crews capture these frightened birds before they succumb to hyperthermia and eventual death.